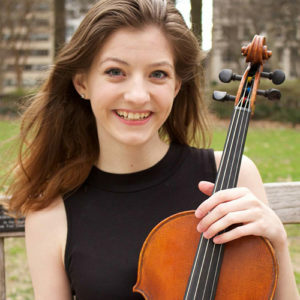 Erika Gray entered the Curtis Institute of Music in 2014 and studies with Roberto Díaz and Hsin-Yun Huang. Ms. Gray holds the Gerry and Marguerite Lenfest Fellowship at Curtis, and she is currently the principal violist of the Curtis Symphony Orchestra which toured Europe in May 2017. She was the featured soloist as “Sancho Panza” in the Chicago Symphony Orchestra’s performances of Don Quixote in February 2017. She has performed in the National Youth Orchestra of the United States of America at the BBC Proms, Pacific Music Festival in Japan, and New York String Orchestra Seminar. Ms. Gray has also performed in venues such as the Sydney Opera House, Royal Albert Hall, Great Hall at the Moscow Conservatory and extensively in the U.S., as well as in Russia, England, Australia, Poland, Germany, Switzerland, and Canada. Ms. Gray recently joined the Philadelphia Orchestra sub list.